Wild caught smoked salmon and avocado on a toasted English Muffin. Avocado is on special at 69c each, or 35c per serve. 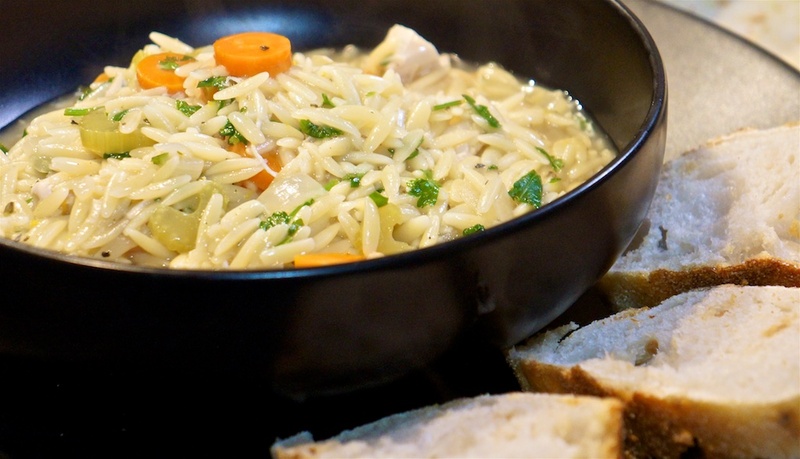 A return to the lemon chicken orzo soup. 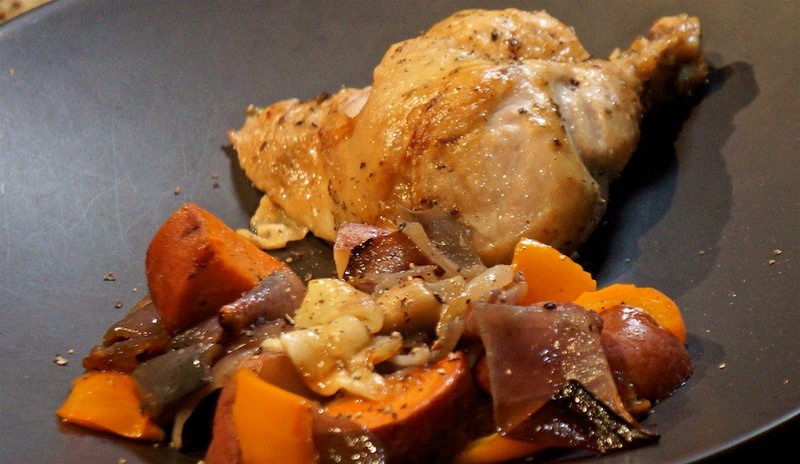 By using the precooked chicken this is a very quick dish to put together. We upped the amount of Meyer lemon – if a dish is supposed to taste lemony, let it taste of lemon! It’s interesting how dishes get interpreted into a local variant based on what ingredients are available. For example, Lemon chicken is one of the ‘standard’ Chinese “dishes” in Australia. Lemons are abundant in Australia but not so much in the USA where oranges are the abundant citrus. Not co-incidentally Orange Chicken is quite common in American Chinese restaurants. No doubt the original dish, in China, is cooked with sour plum or some other sour fruit. Sour Plum Chicken seems to be common in Taiwan. Chicken broth cost 40c per serve The store-bought rotisserie chicken breast is $1.74 for a breast, divided into four serves makes 44c per serve. Add in 15 c for the other seasonings, etc. Dinner tonight – on the table 30 minutes after we got home – cost $1.15 per serve. Even better, there’s enough left over for another two meals, so lunch Monday is taken care of. Lunch today is really last night’s dinner, as Philip will be out tonight eating for free at Editor’s Lounge. New York Strip $18.99 for just over 12 oz is on the high side but comes as part of our meat delivery. It was the most tender strip steak that we’ve ever had with great flavor. Expertly grilled by Philip. This is the third time we’ve done crash hot potatoes this month. on January 7, and they’re a regular side for us because they mix a creamy interior with a crisp exterior. Creamed spinach made to Pioneer Woman’s recipe is – we think – better than we’ve had in a steak house. All the $2.29 spinach and arugula mix was used, and half the $4.69 whipping cream. (We tend to go premium for dairy so we can be happier about the lives the cows live.) $2.67 a serve. Today’s main meal (I’ll count it as dinner) was $12.22. I think quality and flavor it was as good as, or better than a steakhouse. When you cook food this good at home, you quickly realize that “going out to dinner” is about the experience, not the food in most cases. For Philip, dinner was fee, thanks to Alpha Dogs and Editor’s Lounge sponsors. Greg put together a commercial noodle soup ($3.79) with some canned baby corn ($2.29) for a per serve cost of $6.08. Buying pre-prepared is expensive, and you have no control of what’s in the food. With an early start to open our house half an hour away for flooring work we worked for a while on the yard, then headed down to the Country Deli in Chatsworth for lunch. Eggs Benedict with home fries, arnold palmer, tax and tip came to $20 each. We had planned a steak, creamed spinach and crash hot potatoes, but work was still proceeding on the floor late, and we weren’t home until 7pm. So, the joy of leftovers and commercial chicken! 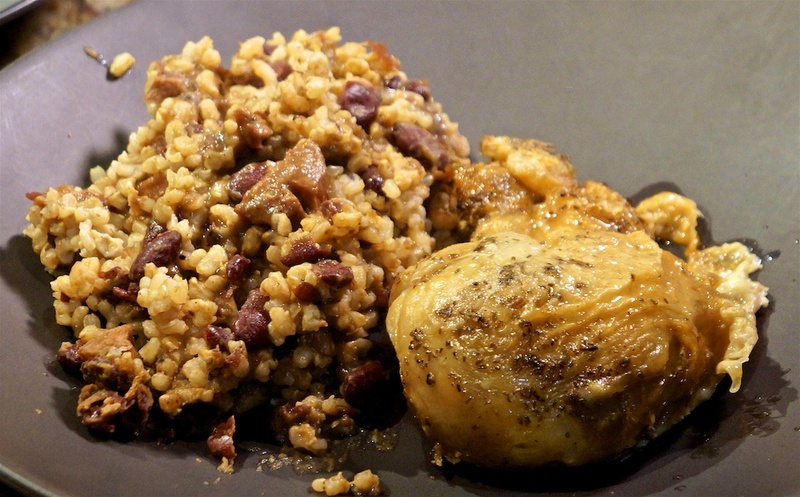 We finished the last of the red beans and rice, and each had a chicken leg from this week’s rotisserie chicken. Dinner tonight was on the table within 15 minutes, and cost us $3.84 a serve. Left over beef stew. Stews are always better the next day. A little less bread, so a little under the $6.10 last night’s serve was. It’s LACPUG night and there’s a ritual of pizza after the meeting. To get us through to Palermo’s at 10pm we had a beef hot dog from Advantage Catering who set up at the meeting to provide a lot of food choices. Hot dog $3. At pizza everyone puts in $5, so ‘dinner’ cost us $8. You know what pizza looks like, so no photo! This week’s chicken was $6.99 or $1.75 per portion. Part of the gamble of a supermarket roast chicken is that it can become overcooked sitting out, and sadly this one is. Tonight we cooked Serious Eats’ Beef Stew because there was one pound of stewing beef in the monthly meat delivery. You can certainly buy cheaper stewing meat than $9.79 a pound but everything we’ve had in the meat delivery has been worth the extra in flavor. We did it with one pound of beef, not the three in the recipe, and added more mushroom to balance it. Greg swapped out chicken bone broth for the chicken broth/gelatin combination because bone broth has gelatin and more flavor! He also dropped the pearl onions. Accordingly there are five serves in our version. 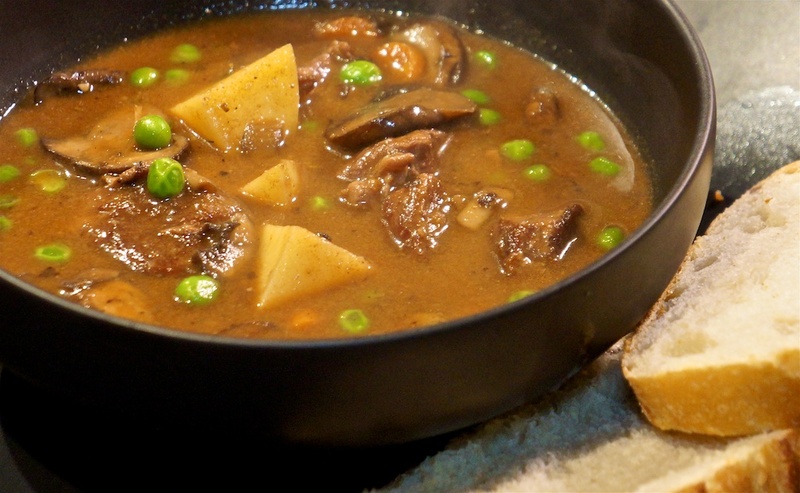 It’s a very unusual recipe with a sauce made in a blender; meat, mushrooms and some of the vegetables fried off in the pan; and some vegetables going into a stock. It was obvious that there was stock-in-progress when vegetables went in unpeeled and/or whole. When vegetables go in unpeeled, you’re building a stock. Sure enough, they get fished out later. Then the meat, mushrooms, cooked diced carrots and pearl onions go back in to simmer while cooking the potatoes and meat. 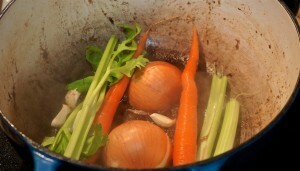 The cooked components waiting to be added back to the stew after the stock vegetables are removed. Tonight’s beef stew cost us $6.10 a serve. With a long slow cook it develops great flavor. 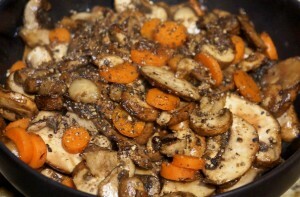 Although meat light this has amazingly deep umami thanks to the mushrooms. Wild caught smoked salmon on an English muffin with cream cheese. Because it’s a 4 oz pack, it’s a generous serve of smoked salmon each. Cream cheese is about 60c a serve. Lunch today was $4.10 a serve. Something else was planned, but we ended up spending more time than expected finding a flooring contractor, and went for leftovers instead. 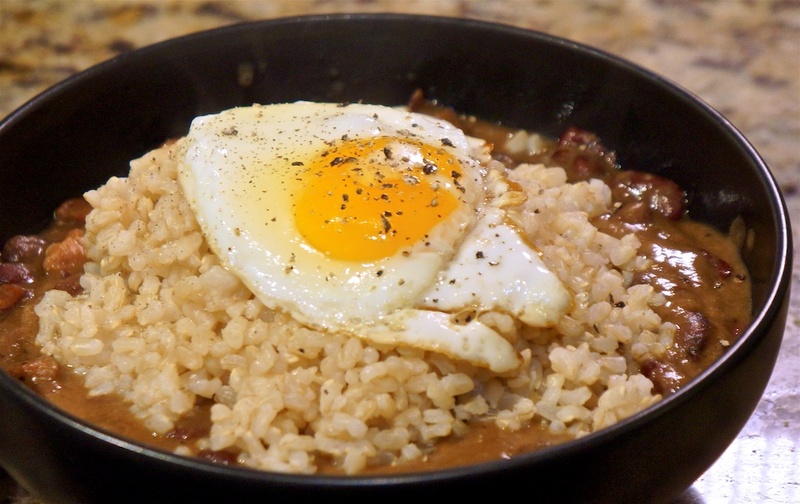 Two serves of the red beans and rice, with a fried egg on top. One organic egg, 50c a serve. Tonight’s quick dinner – the slowest part was cooking the rice – cost us $2.59 each serve. I’d have liked an extra egg, but we only had two to share between us! Greg purchased two wraps yesterday, but half a wrap proved to be enough, so we finished the other half today. $2.00 a serve. From the steakhouse to the South! 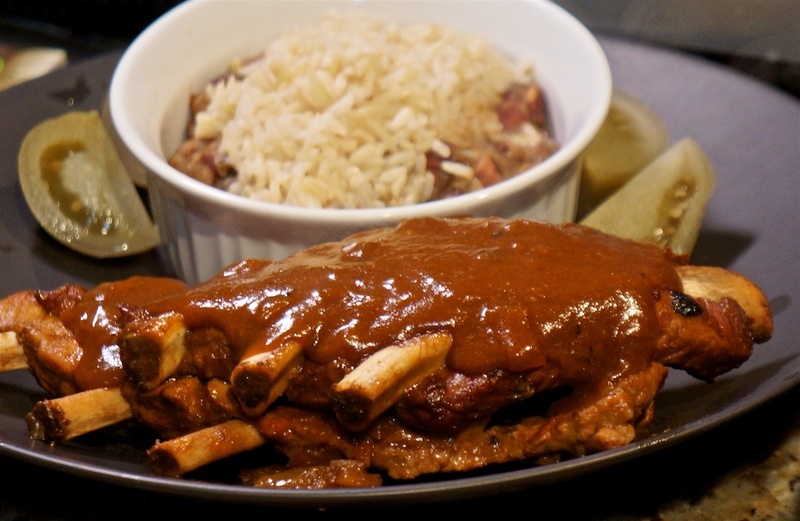 Barbecued spareribs with red beans and rice. One advantage of the monthly meat pack is that there is a lot of protein in the freezer! Choose one and build a meal around it, and tonight spareribs seemed like a good idea. Although 1.5 lbs seems like a large serve, remember these are more bone than meat. The red beans and rice can take up to four hours to cook, but for us it was done in about two and half, and the kitchen smells wonderful while it’s cooking. It’s a slow cooker recipe, but Greg experimented – again – with using the induction cooktop and a large cast iron pot. Since the induction cooker can be set to pretty much the same temperature as a slow cooker, it seemed like it should work. And it did. This recipe makes six serves. We found the Creole seasoning to be mostly salt, but fortunately the beans were unsalted so it balanced out. The heat from the andouille sausage builds during the cooking. Pressure cooking the meat with it’s sauce took 20 minutes. Tonight’s meal cost us $8.00. There are four serves of the red beans and rice for a couple of other meals. Working on our house – constructing a pathway – totally distracted from food today and it was late before we grabbed some wraps from Ralphs nearby. Each wrap was $3.99 and it turns out half is enough. $2.00 a serve. 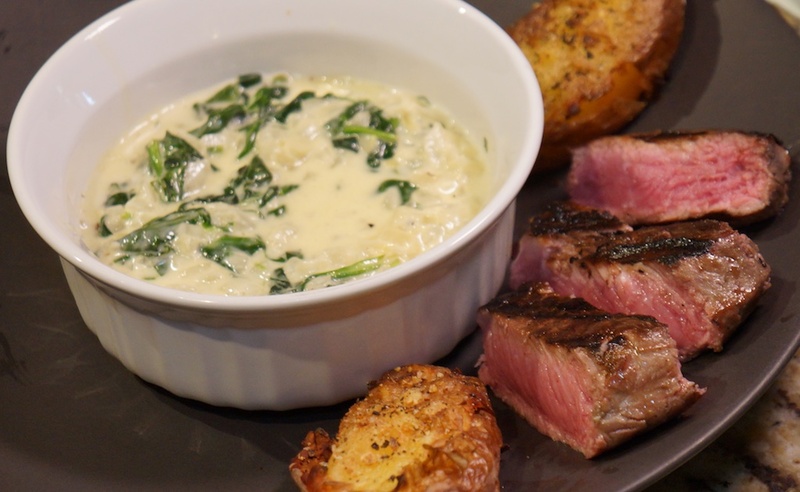 Clearly another ‘steakhouse’ night with steak, potatoes and creamed spinach/arugula. The sirloin tip came from our monthly meat package. In Australia that cut is known as ‘rump’ (which is different from rump here in the USA) and was my father’s favorite steak. Grilled in the outdoor kitchen here at Avalon Burbank. We should make the most of it before we move out. You may notice that we like our beef generally on the rare/blué side. Sirloin tip is not a tender as filet, but it has great flavor, particularly this steak from our supplier. We did the crash hot potatoes on January 7, and they’re a regular side for us because they mix a creamy interior with a crisp exterior. 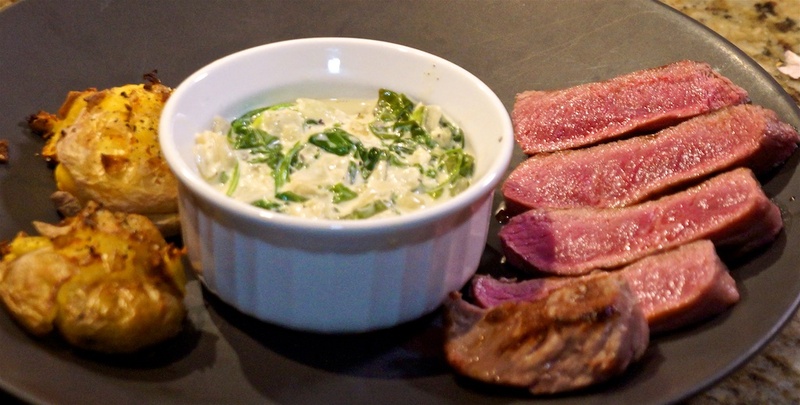 Creamed spinach – or a spinach/arugula combination – is incredibly easy and very, very tasty. Tonight’s steak was nearly 11 oz for $6.11 or $3.06 per serve. That serving size is just slightly below a standard restaurant protein serve of 6 oz. We prefer to go ‘meat light’. All the $2.99 spinach and arugula mix was used, and half the $4.69 whipping cream. (We tend to go premium for dairy so we can be happier about the lives the cows live.) $2.67 a serve. We’ll allow 55c for the potatoes and seasoning. Tonight’s steakhouse meal cost $6.28. Now go to a steakhouse and have a 6 oz steak, and two sides and see what it costs. Busy day, all over the place today, so we stopped in again at the Country Deli in Chatsworth (near our ‘new’ home) before heading up to that home to clean the yard and supervise a plumber. With an Arnold Palmer, tax and tip my $14.50 marinated skirt steak was just over $20. But it was very good. 10 oz of really good skirt steak cooked perfectly, three good eggs and crisp home fries. And a bagel. Because we weren’t sure what time we’d be back from the house, we planned on an easy ‘reheat’ dinner: the double potato halloumi bake from Jan 17, and the thighs and drumsticks from this week’s roast chicken. Yam/Sweet potato was $1.03 or 26c a serve. Tonight’s reheat dinner cost $3.74 and very little time. Because we needed to shop, it was easy to pick up some fresh sushi from Ralph’s at the same time. $6.39 a serve today. 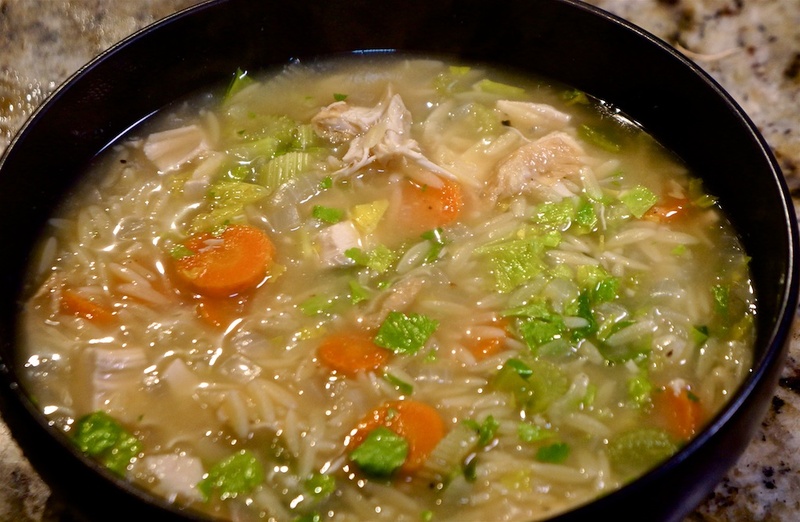 The Lemon Chicken Orzo soup is a great mid-week dish as it take little time to prepare because it uses pre-cooked chicken. The meyer lemon is again perfect for this dish because it lacks the extreme sourness of most lemon. The recipe made three very generous serves, even with less chicken than the recipe called for. Not only is it easy to cook, but it is amazingly delicious for the tiny amount of work it takes. We served with a par-baked Roast Garlic Bread. Orzo is a small pasta shaped like rice, but a little bigger. The store-bought rotisserie chicken breast is $1.74 for a breast, divided into three serves makes 58c per serve. Dinner tonight cost $1.65 per serve!